National Novel Writing Month is just a few short weeks away. By now you should already be getting your mind right for the long haul. Whether you are a Pantser or a Plotter, there are some things you can do in October to prepare yourself. For one, you can check out JR Frontera’s Nano Boot Camp. But there are other things that you can do to be ready. My favorite thing to do leading up to Nano is establishing a writing nest. Most people already have a spot in there home to write. Now is the time to clean it up and get it ready. And this isn’t just good to have for Nano, being comfortable in your writing environment and keeping it distraction free is a must! Here are a few tips. When writing, the last thing you want to do when you are in the zone is stop and get up to do something stupid, like fetch a notebook or find the power adapter for your laptop. Make a list of all the essential things you need are arm’s length and put them there BEFORE you sit down and start writing. I like to have some beer or whiskey, a notepad, some slippers, a blanket, my outline or notes from the day before and the internet (though tread lightly on the last one). To me one of the biggest ways to get in the zone is to listen to music. Making playlists specific to the project you are working on is really fun to, so make sure you have those playlists queued up and have your headphones ready. Maybe if you live alone you can blast the sweet tunes across the room, but I find the headphones help pull me into the nest and bring me closer to the material. This should go without saying. The idea here is to not leave the nest until you hit your word goal for the day. The most common way to fail at that is getting up to fetch a drink of water or a something to munch on in between thoughts. Don’t do it! Make sure you have a large drink nearby and something to eat. Some people like to reward themselves with candy or chocolate. Others just need the energy and want a power bar or something with caffeine to keep them going through the night. Whatever it is that fuels your fire, have it on hand. Don’t make the mistake of losing your charge by getting up to go search for something. Everyone needs different motivation and I find that one of the more important aspects of a good writing nest is where you set your seat. Finding a good chair is paramount. I prefer to sit in something really soft, often opting to write on my couch. But there was a time that I thought I needed to comfort of a desk and a really hard chair to remind me of school. Happy to report that is no longer the case, but if you need to be uncomfortable to be productive, then by all means, reserve that seat and don’t let anyone take it! This one is easier said than done. But there are a few hard and fast rules. Don’t watch TV while you write, limit the use of social media, don’t work on more than one project in the same writing session, Those should be common sense. The next batch might take some more work. Write when your kids can’t bug you or your spouse for that matter. I have pretty good luck writing with my wife in the room (as long as I have headphones on) but some of you poor bastards might not be so lucky. So just get away, hide, sit in the closet if you have to. Sometimes you aren’t writing at home. You are at a write-in or at a coffee shop. 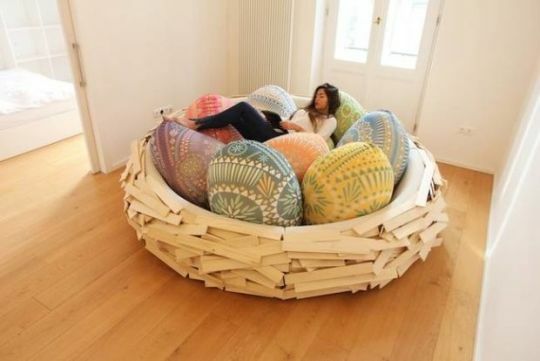 Make your own mobile nest. Most of the same rules apply, bring your headphones, pick a good chair, don’t be distracted by the internet, buy food and drink before you sit down. If you only like writing by candle light, bring a candle to a bar! If you can’t write without sitting on your lucky pillow, BRING IT! Do whatever it takes to get in the zone and more importantly, get that word count! What is in your writing nest? I would love to hear about it or see a picture of it in the comments.